First published by Aperture in 1988, At Twelve: Portraits of Young Women is a groundbreaking classic by one of photography's most renowned photographers. To mark the book's thirtieth anniversary, Aperture is reoriginating it in a masterful facsimile edition that retains the purity of the original. 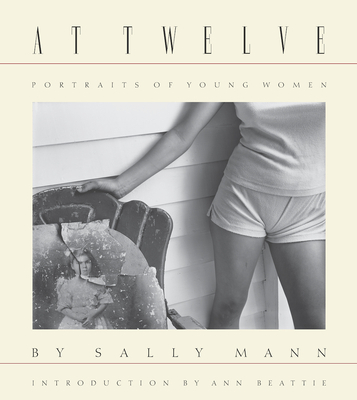 At Twelve is Sally Mann's revealing, collective portrait of twelve-year-old girls on the verge of adulthood. To be young and female in America is a time of tremendous excitement and social possibilities; it is a trying time as well, caught between childhood and adulthood, when the difference is not entirely understood. As Ann Beattie writes in her perceptive introduction, "These girls still exist in an innocent world in which a pose is only a pose--what adults make of that pose may be the issue." The consequences of this misunderstanding can be real: destitution, abuse, unwanted pregnancy. The young women in Mann's unflinching, large-format photographs, however, are not victims. They return the viewer's gaze with a disturbing equanimity. Poet Jonathan Williams writes, "Sally Mann's girls are the ones who do the hard looking in At Twelve--be up to it "
This reissue of At Twelve has been printed using new scans and separations from Mann's prints, which were taken with an 8-by-10-inch view camera, rendering them with a freshness and sumptuousness true to the original edition.